In an effort to exert more control in China’s troubled Xinjiang region, Beijing is forcing the Uyghur people to work for free on various public works projects, according to a World Uyghur Congress (WUC) report issued this month. Called the “hashar” by the Uyghurs, the WUC contends that the Chinese government is using the system of forced labor as another way to repress the local people in the region. China’s ruling Communist Party formally banned hashar in Xinjiang decades ago, but according to the WUC and sources in Xinjiang who spoke to RFA’s Uyghur Service, it continues. “In East Turkestan the hashar was suspended for a while, but recently, it has been reactivated in order to monitor Uyghurs’ daily activities collectively and to control their movements,” WUC Secretary General Dolkun Isa told RFA. “To some extent it is comparable to the organized labor in China’s labor camps,” he added. East Turkestan is the name some Uyghurs use for China’s Xinjiang Uyghur Autonomous Region, where they would like to re-establish the independent state that briefly existed before the founding of Communist China in 1949. “Uyghurs living in the southern prefectures of East Turkestan, including Aksu, (in Chinese, Akesu); Bayingolin, Hotan (Hetian) and Kashgar (Kashi) have been forced into unpaid labour for the ostensible purpose of ‘stability maintenance’,” the WUC wrote in its Forced Labour in East Turkestan: State-Sanctioned Hashar System report. The report was produced with material compiled through investigations conducted by RFA’s Uyghur Service. RFA is often the sole news organization that covers activities in the Xinjiang Uyghur Autonomous Region, where China tightly controls the press and travel. According to the report, subjects of the hashar work from four to 11 hours a day on a variety of public works projects that include sand encroachment control, waterway maintenance and road improvement projects. In addition to the unpaid work, Uyghurs are required to pay for their own meals, transportation and medical costs. If they are sick or injured they are “responsible for sending a family member to cover their missed hours,” the report finds. Penalties for missing work are typically 100 Yuan (U.S. $15) per day, and those who fail to show up to work have been subject to police investigations and detentions that have lasted up to 30 days. The farmer, who spoke on condition of anonymity for fear of retaliation by authorities, told RFA that he and others had recently been pressed into the hashar. A female farmer in Aksu told RFA that the hashar comes in the spring and fall, typically when there is a lot of down time on the farms. 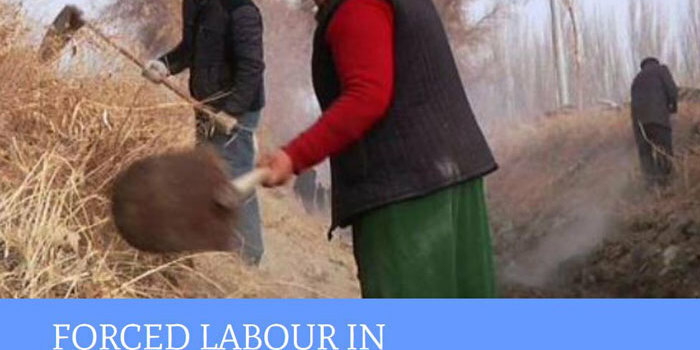 While much of the hashar involves difficult manual labor, sometimes the hashar consists of indoctrination sessions that often take up three days a week, an 80-year-old Uyghur farmer told RFA. Dolkun Isa says that the hashar violates several of the international treaties signed by the Chinese. “China signed the UN’s labor law related convention in 1999, but they are enforcing some items, while ignoring some such as the prohibition on forced labor,” he said. The mostly Muslim Uyghurs have complained about pervasive ethnic discrimination, religious repression, and cultural suppression by Beijing under its series of “strike hard” campaigns in Xinjiang in the name of fighting separatism, religious extremism and terrorism. But experts outside China say Beijing has exaggerated the threat from Uyghur “separatists” and that draconian domestic policies are responsible for an upsurge in violence that has left hundreds dead since 2012.